While the above quote can be completely taken out of context, and be proven to the contrary (bingo parlours and bars) …the most recent events revolving around the “Idle No More” campaign should prove this statement true. It seems that when faced with crisis, the entire Nation of Indigenous peoples on Turtle Island, can put away personal differences and rise together as one. The truth of the matter, is that we are ALWAYS in constant crises. One only needs to look at a few industries that destroys our ways of life, such as the tar sands, forestry, mining and commercial fishing, not to mention the area known chemical valley in Sarnia Ontario. These industries are the backbone of Canada’s capitalist economy which destroys all life on the planet. These industries also fail to recognize the ecological disasters they are creating, where we the Indigenous peoples who live in and around these industries are sick and dying from the aftermath. Furthermore, we do not get to partake in the economic sharing, forced either to live in poverty or assimilate in urban centres, leaving behind our ancestral lands and the ways of life that go with it. The true history, and the true Law of the Land is the the “Gushwenta” or the Two Row Wampum belt. This is the confederacy of peace that all nations, including European nations like the Dutch in 1664, the French in 1701, and the British in 1763 all adopted into. The basic principles of this Great Law are, Peace Co-existence and Non-interference, founded upon peace, righteousness and respect. The Two Row Wampum is a pure white belt with two rows of purple. There is a much deeper explanation of this belt, and how it can be applied to individuals, marriage, and how we function within the greater context of community on multiple levels but for now, I’ll just explain the shortest version, which is our Nation to Nation agreement between Indigenous and Settler Nations. The way that I have come to understand this Great Law of Peace, is that we share the resources of the land in brotherhood and sisterhood. We are Nation to Nation allies and where we come to each others aid in times of distress and war (hence the reasons we fought alongside the British in the war of 1812.) It is also fundamentally understood that we have different ways of life, and that we are entitled to these ways of life, as long as our ways of life do not interfere with each others. As evidenced by history, the British nations represented by Canada have not upheld their end of the peace agreement, and has been interfering with ours. As this Idle No More campaign grows all across Turtle Island, we must be careful about the direction the movement will lead. I myself, took part in one such rally, and as powerful as it was…there is the potential for danger. As we marched down University Avenue in the downtown core of Toronto, some of the chants were “Who’s land is it? Our land!” “Who’s Land is it? Our Land!” If one follows the Two Row Wampum, and is of the mind that we share equally…then is it not the Settlers land just as much as ours? When the British North America Act was enacted in 1867, and all the numbered treaties that fell afterward, the Canadian Government gave most indigenous exclusionary rights to the land and waters, over the Canadian Settlers….thus creating a division amongst two nations, that were once allies. The fact remains however, that the corporations represented by Settler occupied Canada are directly interfering with our distinct way of life, which is in direct conflict of the the Two Row Wampum agreement. This would suggest that we are well within our sovereign rights to take back that land, that we agreed to share, until the two nations can agree to co-exist with each other, in mutual harmony with the earth.. Without fundamental understanding, and education of the Two Row Wampum and the roles and responsibilities on both Indigenous and Settler nations, we could see a greater division of Indigenous peoples and Settler Canada. This is an outcome we must all work to prevent. We recognize that we are in the Seventh Fire. We have two roads to choose from, and that is it. There are no alternatives. We can continue supporting this destructive world of capitalism, imperialism and individualism, in which we end life for all Earth’s people. Or we can return to our natural ways in balance with the Earth. It is all or nothing. The Eighth Fire Prophecy says that if all nations Black, Red, White, Yellow, can all collectively agree to live as equals, in harmony with each other and the rest of creation…we can continue on for many more years. The Eighth Fire Prophecy cannot be lit, if we cannot agree on this simple solution. Which brings us back to the Two Row Wampum Belt. Peace must be restored, and all nations must agree. Nanaboozhoo, the Original man is said to have gone to sleep. The Anishinabek people no longer considered him useful and viewed him more of a clown or a trickster. He was hurt and ashamed, and went to sleep on top of a silver mine to protect it from being excavated. In our teachings, it is said that he may wake up once again, when the Anishinabek need him. Well, the time for need is far overdue. We are at the precipice of disaster. And only a return to our original ways can arguably save us. I was fortunate to listen to Jacob Wawatie and Louise Wawatie of the Algonquin Anishinabek Nation talk about the Sleeping Giant, and the Eighth fire. They suggested, that the kindling of the Eighth Fire already lies in each in every one of us. But it is up to us, to work together, and to unite all the peoples of all the directions to light that Eighth and final fire. They also said, that the Sleeping Giant is the spirit of the Anishinabe, and only when we can rise together as one, can we say the Sleeping Giant as awakened. What the Idle No More Campaign has successfully done, is to stir some interest, and to get the people to march, and rally all across Turtle Island. Could this be the awakening of the Sleeping Giant? If so…then we must be wary of what direction we lead this Giant, and if we are to successfully rouse the Giant, we must ensure that this Giant never goes back to sleep. There is lots of work to be done. I am just a humble Anishinabek man trying the best to live these teachings. I am not perfect nor do I profess to be. These are basic principles we all used to abide by. All nations have their variations of these laws, but few actually practice them. The more that I try to abide by these laws, I gain a greater understanding of unity. Let me use the Grandfather of Love for instance. Understanding that I am a sacred part of creation…and that everything in Creation is sacred…then I have a greater sense of Love for all. Through practicing this Grandfather Love teaching, I have come to understand forgiveness. Which means that I must forgive the shortcomings and short sightedness of the colonial settlers, and against all odds, turn a negative into a positive. Understanding these few things, I understand that the Eighth Fire needs the love of all nations, loving the rest of creation. Is it not incumbent on those who understand these teachings, to teach others, and to actively seek out a solution that can unite us all? As we partake in our marches, rallies and protests in the coming weeks and months ahead…we must consider why we doing this exactly. And what exactly it is that we hope to achieve. Are we merely doing this to protect the few rights and privileges doled out and governed by the Indian Act? Are we doing this because we are tired of living in poverty and we would like a larger lions share of the economic provisions? Are we doing this because we don’t want to be assimilated? Are we doing this to protect our inherent ways of life? Why aren’t we doing this to unite all nations and recognize commonalities within the struggle of all four colours. There are a few of us who grasp the much larger picture, and appreciate the potential for greatness. Some of us are desperately trying to awaken the Sleeping Giant, and light the Eighth Fire. We have been divided as Indigenous nations, and from our settler nations for far too long. It is time to revitalize the Two Wampum and restore our nation to nation agreements from the grassroots. It is the people who will make the change. Not the selected leaders. The extinguishment of our Treaty rights seems to be the main attraction, bringing us together. The four colours have been divided for quite sometime, and that separation hinders the ignition of the Eighth Fire. The recent growth in revolution and uprising, across the globe (most notably in Europe) has made it obvious that capitalism has failed all four colors equally and; all peoples of the earth suffer from the greed and destruction caused by the few. Wouldn’t it be amazing, that if this momentum were to successfully unite all on nations on Turtle Island, awaken the Sleeping Giant, and light the Eighth Fire all in one fell swoop? It could potentially be the catalyst that would change the outlook of the entire planet. Some people would argue that I’m dreaming too big. But thats the amount of love that I have for all of Creation. The eleventh hour, of the Seventh Fire prophecy ticks on…which road are you going to choose? Wise words. I see a way to peace and good life with this. the treaties are not the foundations of our nationhood. treaties don’t make nations; nations make treaties. As long as there is one ‘Nish gangster, one ‘Nish prostitute, and/or one ‘Nish crackhead, I won’t believe that we are in the seventh fire. some elders and chiefs are living in a golden age for sure, but the rest of us are still in the struggle. we are only in the 5th fire. the deception of the 5th fire is the laser-like focus on treaty rights. 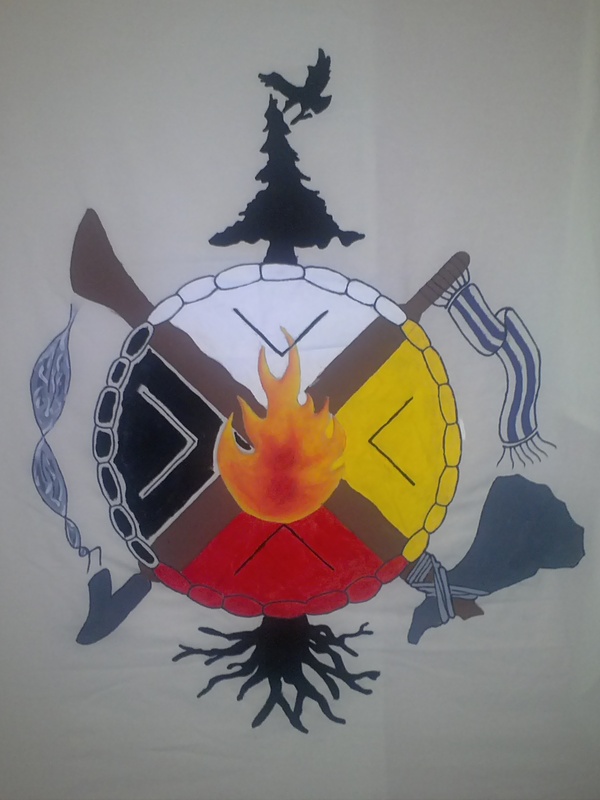 the true way of being Anishinabe lies in duty to family, community, and to the nation. the way of duty is enshrined in the teachings and structure of Dodem. someday, and I pray that it is soon, the youth will wake up realize that the only way we are going to be strong again is to focus on helping each other and forget about what Her Majesty in Right of Canada will or will not do for us. Those allegedly sacred treaty rights a granted by Her Majesty and can be taken away at the discretion of her agents. our sacred responsibilities are ours alone and no one can take them away. I agree with your last words. But I recognize that the time we are in…the critical turning point on the health of the Earth so to speak…suggests that we must be in the 7th Fire. The way that I have come to understand the 7th Fire, is that we chose a path that returns us to our natural ways. Or we choose a path that continues our destruction and ends all life for people. I recognize how close we are to ending all life for people. DUTY IS THE FOUNDATION OF OUR NATIONS, NOT THE RIGHTS GRANTED BY A FOREIGN POWER.